According to statistics from Vinalines, total container throughput shipped via Cai Mep International Terminal (CMIT) reached 1.24 million twenty-foot equivalent units (TEUs) during the period, up 12.2 per cent on-year. The seaport also handled 17.34 million tonnes of goods in bulk, up 12.2 per cent on-year. Located in the Cai Mep-Thi Vai area of the southern province of Ba Ria-Vung Tau, CMIT – a joint venture between Vinalines and Denmark’s APM Terminals – produced revenue of VND571.29 billion ($24.84 million), up 18.3 per cent on-year. 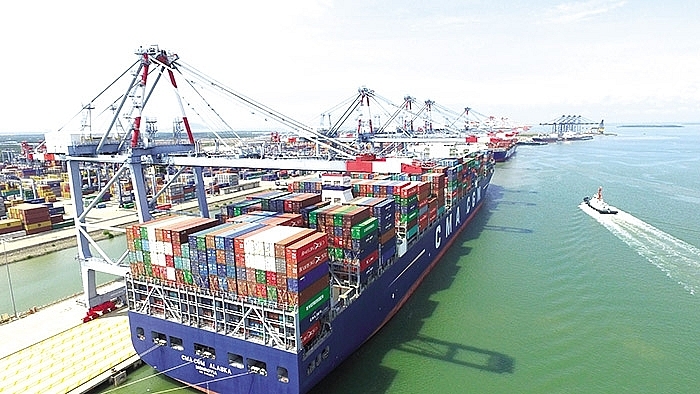 Big improvements were also witnessed at the Cai Lan International Container Terminal (CICT) located in the northeastern province of Quang Ninh in the year ending October, when container throughput soared 131.7 per cent on-year to 145,434 TEUs. This venture, which has US-based Carrix – the parent company of SSA Marine – as a foreign partner, also accommodated 4.416 million tonnes goods in bulk, rising 13.9 per cent on-year, while its revenue ascended 22.7 per cent on year to VND254.3 billion ($11.05 million). SP-PSA and SSIT, the other two joint seaports located in the Cai Mep-Thi Vai area, also made good track records between January and October. SP-PSA, a joint undertaking between Vinalines and Singapore-based PSA, reported an on-year increase of 70.5 per cent in volume of goods in bulk to over 2.57 million tonnes, while the figure was 1.54 million tonnes in 2016. This seaport fetched revenue of VND125.55 billion ($5.46 million), up 48.3 per cent on-year, while the sum was just $3.07 million in 2016, when revenue was already rising at 33.47 per cent on-year. Meanwhile, the joint venture between Vinalines and SSA Marine, SSIT, also witnessed container throughput of 31,038 TEUs and 3.97 million tonnes of goods in bulk, up 26.7 per cent on-year. Its revenue jumped 82.8 per cent on year to VND162.156 billion ($7.05 million). June marked an important milestone in SSIT’s operations when it welcomed the first container vessel, MV MSC Rosaria, which is owned and operated by MSC Geneva, one of the world’s largest shipping lines. Having been actively handling bulk vessels since 2014, the container operations will complement SSIT’s processes going forward. Nguyen Canh Tinh, acting CEO of Vinalines, told VIR that better performance of joint-partnership seaports was attributed to favourable market conditions and growth in the country’s imports and exports. “The positive results are expected to contribute greatly to Vinalines’ growth of 8-10 per cent in the volume of goods shipped via ports this year,” he said. Despite the business improvements, these seaports are said to face a number of challenges, with mounting competition from new ventures and stagnancy in channel dredging being the key concerns. Recently, Vietnamese cities and provinces have been rushing to develop large-scale and costly seaports in anticipation of growing interests among investors and rising trade, thus putting pressures on existing seaports on possible troubles in attracting cargo. In the north, two terminals at Lach Huyen International Gateway Port have been put into operation, with more to come. Many others are also in the pipeline in the south of the country. In central Vietnam, the Lien Chieu port project in Danang and the My Thuy International seaport project in Quang Tri are in the preparation stage and expected to be kicked off in the near future. In fact, joint venture seaports in the Cai Mep-Thi Vai port area endured years of trouble in attracting cargo due to improper planning. They are still being financially restructured due to huge loan costs. Stagnancy in channel dredging is the other challenge. The channel depth of seaports is often dredged every year to enable them to accommodate big vessels. However, the work is often sluggish. Good news for seaports is that the Ministry of Transport (MoT) officially signed a circular im mid-November, allowing a 10 per cent increase in container handling service charges at ports in certain areas, including those in Haiphong and Cai Mep-Thi Vai port area, starting from early 2019. “The rise is aimed at helping port operators increase service quality by applying advanced technology and upgrading infrastructure,” said MoT Deputy Minister Nguyen Van Cong. According to the MoT, the container handling service charge at ports in Vietnam is significantly lower than those applied in Cambodia ($65), Thailand ($59), Malaysia ($75), and Singapore ($111).